As a young man Jesus grew in favor. Noah, Joseph, Moses, Ruth, David ... all found the favor of God. What does God's favor mean and why is it so important? Pastor Duane Vander Klok explores this unique realm of God's poured-out goodness, revealing how to turn negative situations around, increase faith for moving mountains, bless others, and more. Readers will discover that favor, while not automatic, is freely given. Some cautions must be taken, but the prayerful desire to "unblock" God's gifting will lead to dramatic changes. This book is for anyone who has been missing the sweet taste of God's favor--for the time is ripe to reap it in abundance. 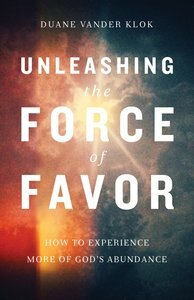 About "Unleashing the Force of Favor"